Cancellation of your booking can be made up to 48 hours prior to arrival. Deposits and commissions paid while making the booking will not be refunded. In the case of a No-show, your credit card is charged for the 1st night of your stay, the rest of that booking will be cancelled. In case you have made the total payment, the same rule is applied and the remaining amount is refunded. City tax is not included, this is 6.5% per person per night. Bookings can only be made with a MasterCard, Visa credit card, AMEX, Union Pay. Maximum stay is 7 days. Upon arrival, you can pay with your credit card/bank card or cash. All nights of accommodation must be paid before or on arrival time. When you have made a reservation over the internet and you wish to extend your stay, you have to make a second, separate reservation for the extending date(s). If there is no online availability on the extended dates, it means that all our beds are booked. You can then try to extend your stay when you arrive at the hostel. Bookings with more than 16 people are considered to be a group booking. Check-in starts at 3 pm. Reception is open 24/7. During check in we will ask 10 euros cash deposit for the Key of your room, please make sure to have the amount in cash and in change. Check-out is till 11 AM! In case you have a late train/plane/bus/torpedo to catch we can storage your luggage for free. Further, we also ask you to kindly remove all the sheets and towels you have used from your room. If you do not receive a booking confirmation, you do not have a booking! If you do not receive a personal response from one of our Staff, this means your request booking has not been confirmed. When making an online booking or via email, credit card details are necessary to secure the booking. You can call the Hostel from Monday to Sunday between 8:30 and 23:30. Bookings of more than 16 people are considered to be group bookings and will therefore only be able to be made via direct contact with the Hostel. We do not allow large groups of men (9 or more), Sports tours, Stag Nights, Soccer fans in the city for international or national matches. You must provide the right information about what type of ‘Group’ you wish to make a reservation for, in case this is somewhat falsely given, the management is in the right to cancel the booking. We are glad to welcome you to Sparks Hostel and we hope that you will enjoy your stay with us. In order to ensure calm, safe and relaxed atmosphere, the house rules stated below will be applied to all of our guests. Valid photo identification in the form of a Driver License or Passport is required at check-in. Guests are required to conduct themselves in a reasonable and responsible manner at the Hostel and must not act in any way which may disturb other guests. Failure to adhere to this requirement may result in Guests being asked to leave the Hostel in which event all Charges and Additional Charges shall become immediately payable by the Guest. Smoking is not permitted inside the Hostel and only in the designated smoking areas. Smoking indoors will result in a fine of €300,-. Guests are responsible for taking care of their belongings. Sparks Hostel will not be responsible for any loss or damaged caused at the Hostel. The Guest may be liable for Sparks Hostel reasonable cost of repairing, cleaning or replacing any property of Sparks Hostel which is damaged, soiled or lost by a Guest. No animals are allowed in the Hostel with the exception of guide dogs. 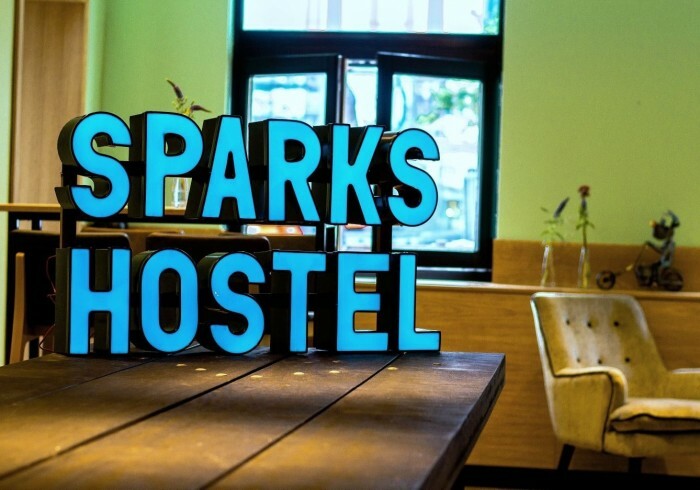 Sparks Hostel does not accept bookings made by those under the age of 18. Under 18’s cannot stay in any shared rooms, however, they can stay in private rooms when accompanied by an adult over 18 years. Failure to adhere to this rule will result in automatic Cancellation with no refund given. Visitors that are not staying in the Hostel are strictly forbidden under any circumstances anywhere inside the Hostel. Please be considerate towards other visitors, especially when you are using electronic media. The quiet time for sleeping is from 11 PM. to 7 AM. Out of courtesy to fellow guests, please be very quiet during this time. It is forbidden to consume food and beverages of any kind in the shared rooms or dorms. Consuming excessive amounts of alcohol within the premises of the Hostel is strictly prohibited. The management reserves the right to confiscate alcohol found on the premises. You are responsible for the cleaning of the kitchen’s counter, floor, and appliances used for the preparation of your meals after you are done, and this also includes the fridge. We offer labels that you can stick to your food. Please use it otherwise we will throw your food away, and you will be hungry and grumpy!